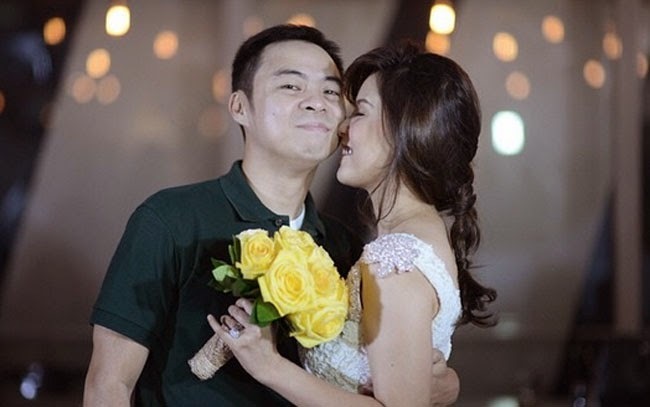 Parokya ni Edgar vocalist, Chito Miranda once again married Neri Naig in their garden wedding in Tagaytay City as announced in their prenup video entitled The Road Trip Sound Trip. Chito Miranda officially got hitched with two year girlfriend Neri Naig a day before their announced wedding date. The civil wedding ceremony took place on December 13, 2014, Saturday, in Taguig City, which was witnessed by close friends and family members. The couple had announced their wedding date as December 14 in their prenup video made by Nice Print Photography and it looks like it is not only the now married Bianca Gonzales and JC Intal who had chosen to tie the knot ahead of their announced wedding date. Nice Print Photography had posted the photos of the ceremony in their Instagram account and announced that it is the first of the two ceremonies. Then on December 14, Nice Print also posted the couple’s photos of their garden wedding. Many netizens had talked about the sudden civil wedding and Miranda’s attire. The couple remained silent on their bashers and is all smiles in their photos. Many also posted their well wishes. Miranda proposed to Naig on May 2014 with a set up of fake music video. The couple had also made news when their video scandal had been uploaded in the internet. Miranda asked National Bureau of Investigation to investigate the matter and find out who had uploaded the video. Both wedding ceremonies of the couple had been covered by Nice Print Photography and many, especially the fans, are looking forward to the newlywed’s official wedding video.